The title of Uruguyan writer Eduardo Galeano’s famous historical narrative, Open Veins of Latin America, evokes the image of a continent stripped bare for the benefit of colonial empires, its veins of rich minerals opened and its lifeblood violently extracted. 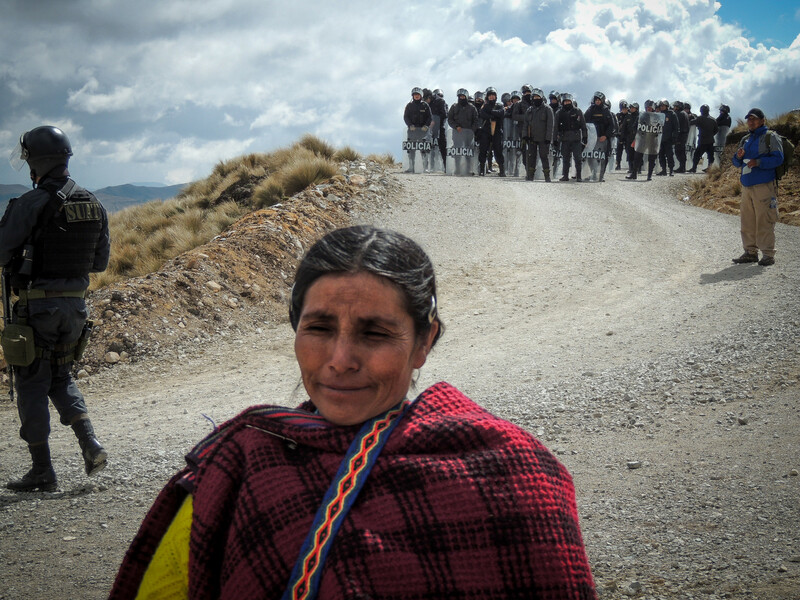 Máxima Acuña de Chaupe near her home in Cajamarca, 2014. Photo by Guaricha. License CC BY-NC 2.0. 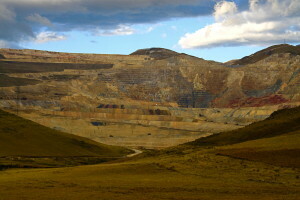 Today, extractivism—the process of removing natural resources such as gold, silver, copper, or zinc from their natural environment—is a critical source of income for many Latin American countries, where taxes from such activities are invested in comprehensive healthcare and education programs. However, the controversial practice often comes at a high environmental and socio-economic price—and one that is disproportionately paid by women. 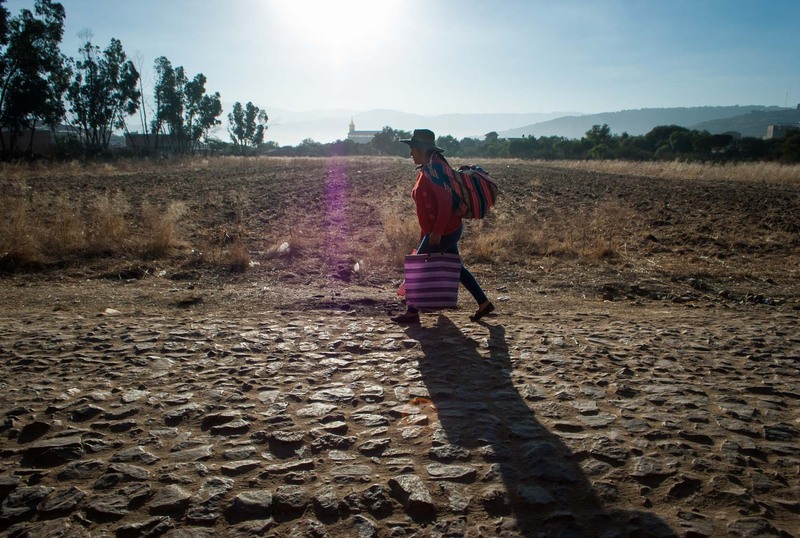 In Latin America, most extractive activities occur in rural areas and/or indigenous communities where land and water sources have faced contamination from mining activities. High in the Andes mountains, the sprawling Yanacocha gold mine sits in an impoverished region near the town of Cajamarca, Peru. Owned jointly by the U.S. Newmont Mining Corporation, a Peruvian mining company, and the World Bank’s International Finance Corporation, it is the largest mine in Latin America and the fourth largest in the world. For years, local residents have been complaining about contaminated water and the disappearance of fish in nearby rivers, lakes, and streams. At Yanacocha, cyanide-laced water is used to separate the gold from surrounding rock, with the toxic brew then seeping into nearby groundwater. Reinhard Seifert, an environmental engineer who has spent the last two decades investigating the effects of Yanacocha on the area’s ecology, found traces of not only cyanide, but also lead, arsenic, and mercury in the drinking water—poisonous substances linked to rising rates of gastrointestinal cancer among the residents of Cajamarca. Adding to the mistrust between locals and the mining company, a truck from the mine accidentally spilled its cargo of toxic mercury in a nearby village in 2000, leading to violent clashes between angry residents and police. 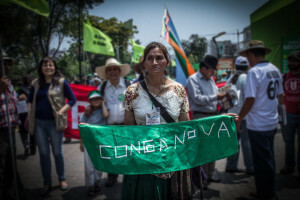 A protest against Conga in 2014. Photo by Davich Mattioli. License CC BY-NC 2.0. Yanacocha then sued Máxima for what they claimed was her illegal occupation of the land, despite the fact that the property deed bears her name. In October 2012, a judge sided with the mine operator and sentenced Máxima and her family to suspended jail sentences; the decision was overturned in December 2014. However, Yanacocha refuses to recognize the latest ruling, and it is striving to claim Máxima’s land by other means. Yanacocha also engaged in a campaign of harassment and violent intimidation against Máxima. On several occasions, the mining company, assisted by Peruvian soldiers and police officers, attempted to remove her and her family by force. 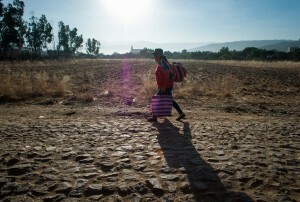 They destroyed parts of Máxima’s home and her potato crop, confiscated her possessions, and once beat her and her daughter unconscious; they also threatened to kill her and the rest of her family. While Máxima may not have been targeted solely because of her gender, women remain easier targets for retaliation by powerful actors like the owners of Yanacocha. Women such as Máxima, who suffer from poverty and illiteracy, are less likely than men to pursue their fights through the legal system. In addition, much of the intimidation that Máxima has experienced has centered on the destruction of her home and farmland—the traditional domain of women, and Máxima’s source of income.